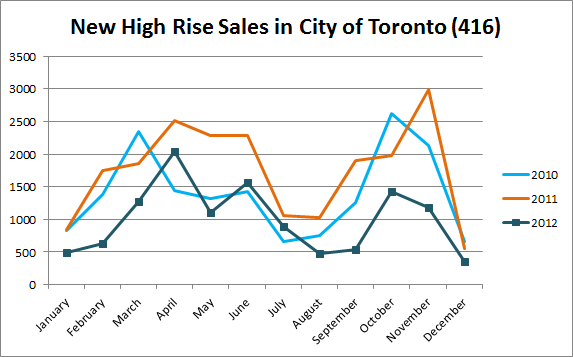 Back in 2011, new condo sales were booming in Toronto and there were 21032 new high rise units sold according to Building Industry and Land Development Association. Fast forward to 2012 and only 11944 units were bought. Now that's a 43% drop in a year to year comparison. When looking at both low rise and high rise units sold throughout the GTA, there was a 29% drop in 2012 vs 2011. By all means, 2011 was a record breaking year, so in order to get a better picture of what's going on you have to look at previous years, and so I did. 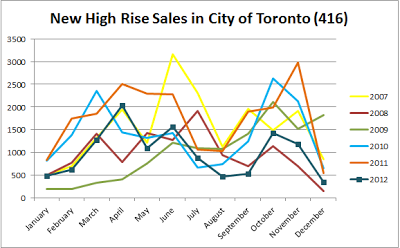 Below is the graph compiled from BILD data on new high rise sales volumes from 2007 through 2012. Notice how the 2012 sales trend line is closer to 2008 and 2009. That's the era of last financial crisis which explains the sales dip. Yet the events from four years ago don't explain the dip in 2012 sales. Rule changes in maximum amortization did play a role in decreasing sales volume but I think there is something else going on. I think what happened is that we are past the peak of this bubble as sales begun to decline early in 2012 as you can see in chart below. 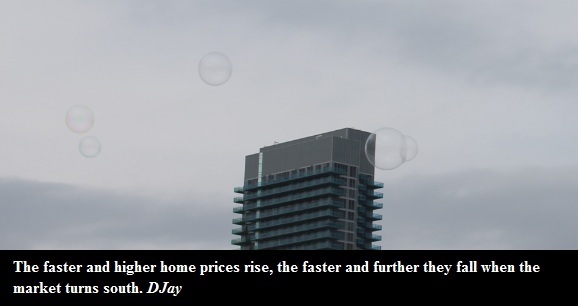 The real test would be the spring market of 2013. Below is how new high rise sales in Toronto look over past three years.